Jordan retro 5 Sweatshirt. Jordan 5 Grape sweatshirt designed to match Jordan sneaker outfit. Jordan retro 5 Sweatshirt. Grape Jordan 5 match Sweatshirts. Air Jordan 5 Grape. Sweatshirt designed to match. Air Jordan 5 Grape sneaker colorway. View the entire matching collection of Jordan 5 Grape. 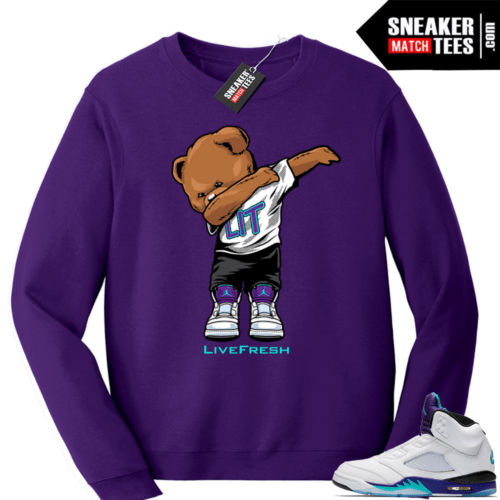 The Dabbin Bear sweatshirt was designed to go with your sneakers. This design is exclusive to Sneaker Match Tees Online shop. Complete your Sneaker outfit with this exclusive design.